Combine the strength of a leveling jack with the steadiness of a stabilizing jack! New, highly engineered, low profile design is perfect for use with travel trailers and fifth wheels. High strength allows for stabilizing increased loads and fine leveling. Rapid extension provides quick activation of both up and own movements. Integrated foot makes for secure, increased ground contact to prevent slipping or sinking. 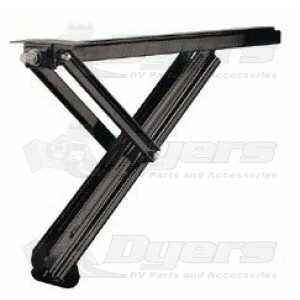 BAL "C" Type Stabilizers are designed to mount to the trailer frame where the crossmember meets the main frame member. The made in China jacks on our 2013 Jayco bent after a recent week long stay with the jacks extended way out on a steep slope. After some quick research I ordered the BAL 19" C jacks on a Monday afternoon and received them Wednesday morning. I had the jacks installed a few hours later. They looked really decent and was sure they would last. We just came back from a long weekend camp. What we quickly noticed was the more stable feel of the new jacks. These will not flex under normal walking in the camper. I did not expect but was pleased with the stability. I did purchase the foot pads for the jacks, nice size. Good product, fast order/delivery, reasonable price, what more could you want? I wasn't concerned with the mounting screws since the jack is under compressive force while extended and there is very little shear force.